Purestream ES, LLC is proud to offer Sigma Model APM low-speed mixers. 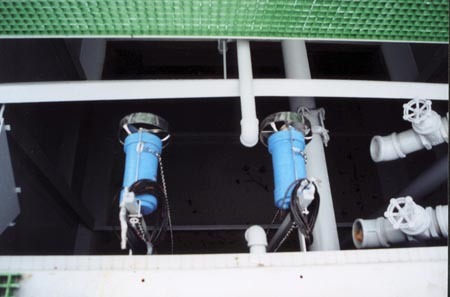 These submersible mixers are designed using a direct-drive propeller system without using a gearbox. The mixerâ€™s speed is determined by the number of poles on the motor winding. Equipped with two possible configurations for protection against seal leaks depending on size, the Sigma mixer is suited for a variety of applications. Either protected by two mechanical seals with a face sealing element or with one mechanical seal combined with a radial shaft seal ring, you can be confident that our APM mixer is the right mixer for your application. The squirrel-cage style induction motor is cooled by the immersion in the liquid to be mixed. Our mixers also include a thermo-overload relay to warn of overheating conditions. Sigma APM mixers are made with a painted cast iron body and stainless steel propeller and shroud. A number of our smaller size units are also available in all stainless steel. These heavy-duty mixers can be immersed in liquid ranging from 3-10 pH and up to 104 Â° F, and are also intended to be installed at depths up to 33 feet.